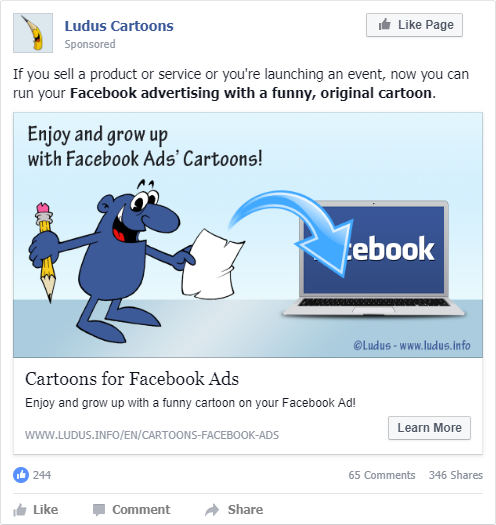 How many people use cartoons for Facebook ads? Marketing expert consider Facebook the best platform to promote a service or a product. After all, Facebook itself says that the social is used by as many as 2 billion people every month. Fertile ground for advertising. And advertising on Facebook works, as evidenced by the many data available. It’s also easy to place advertisements on Facebook, you can reach the right audience and the costs are low: you choose how much to spend. Who said that a picture is worth a thousand words was right and even Facebook is agreed: today you can create an advertisement with a clean, engaging image. What image should you use? If you sell a product, the picture of the product itself becomes the protagonist of your advert. But for an event, a service or even for some products you can choose to create a cartoon for your Facebook Ads. Funny cartoons have been used in marketing and advertising for decades: even for advertisements on Facebook, a cartoon is an idea to be exploited. Send me your idea, talk to me about what you want to promote with Facebook ads and I’ll study the best way to create an advertisement: a humorous character or a cartoon. A Facebook advertising with a cartoon. Draft of the drawing: I’ll send you a cartoon designed to comply with the rules of Facebook for advertising. Draft of the graphics: I’ll send you a dratf of the advertising graphics, too. Inking and coloring of the cartoon: after your approval, the next step is inked and colored character or cartoon. Image Text Check: through the Facebook’s tool I’ll check if the text in the image works good for Facebook’s rules. Complete graphics of the ad: I’ll send you a high resolution jpg or a png file of your cartoon.